...good thing I have some cheap tricks to feed it! Okay, that sounds awful (heeheehee.) What I mean is I am in love with watercolour paper. (I was really cheap before and wouldn't buy it, but I caved so I could use it with Maria's seriously awesome trick with of watercolouring with SU markers and now I love it. Gesso paper to make fast free embossed sentiments: You may never need to buy another sentiment stamp again (shut my mouth! I know. I'm just jokin') ;0) but you can make easy embossed handwritten sentiments. Just write on a piece of cardstock that's got gesso on it with a Stamp'n'write marker & then emboss it. It can be kind of neat to have handwriting too; I was hoping this looked like something someone wrote on their "To Do" list (hence the sentiment on the card front.) :0) You could write the whole little message inside your card embossed this way if you wanted to. 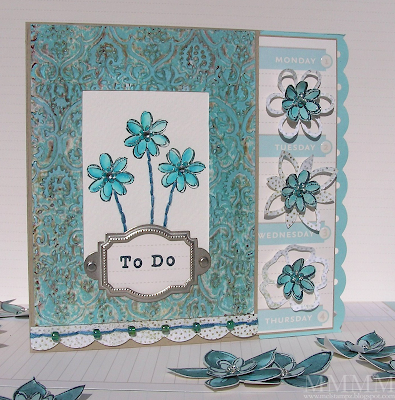 Other card details: Cardstock: Watercolour paper, Kraft, Cool Caribbean. Hodge Podge hardware. Scallops made with corner rounder & hole punch. WOWZERS This card totally ROCKS! I love all your tips and tricks! You always inspire me! woweee girlie... such good things! You have been nominated for an award. Post to be up in a few hours. Wow, you always knock my socks off!! I have a binder with alot of your tuts in it. Please don't ever quit. WoWzA, Mel-a-licious! This is awesome!! Love, love, love, it!! So many cute, inexpensive tips; can't wait to borrow some of 'em! Thanks; You Know You Rock!! PS: I visited Sue Blu the other day ... wowza, THAT was interesting ... and I felt w-a-y crazier upon leaving than I did when I arrived! Does she have that affect on you too?!? PPSS: Can't wait to go back! I love the flowers you made. They are far prettier than primas anyday. Feeling good that we are saving money we tend to spend more somewhere else. sound familiar? I like that handwriting and embossing idea. I never seem to have the right sentiment and I just print mine on the computer. I am going to give it a try. Thanks for all the inspiration Melberry (Mel+strawberry). Love those primas. Now how did I miss that before? The beads on the scallops just add that perfect touch. Gorgeous card girlfriend. Love it. Great detail with the embroidery thread and beads. Love the faux metal cuttlebug bg paper. Can't wait to see what you make with your new scorpal. You so deserve someone to be kind to you. That was so nice of the lady who sent it to you. karma does work and you take so much time on your blog and answering questions. We are all lucky to have you blogging!!!! You are always so full of information!! I love it!! Beautiful card! And I love the colors. Beautiful work, thanks for the tips. I'm sitting here with my mouth open so wide I look like I'm catching flies cause I'm blown away again by you. This is awesome Mel. Love the card, the great tips, and your commentary which always puts a smile on my face. AMAZING!!! you are so talented! I hope to one day have time to sit and come up with some of these cool tricks! or at least try these! SO BEAUTIFUL!!! All that comes to mind is WOW~ ! BTW .. I spent an hour backtracking my pg to find the post with the gel card and the link tot he CuteE stamps!!! LOL. Can I link you?? I just found your blog and I love it! The card is beautiful! I'm linking you to my blog so I can come back and check out all your older posts. Great stuff! Thanks! You could sell your Primas and make a fortune ha ha. Fab card as usual cannot wait to have a go. I have just found your blog, and would just like to say thanks for all the hard work that you have put into it, and for sharing your talent with us! Mel how cool is that! I love the crystal effects! You are the awesome-est!! Awesome mix of techniques here Mel! If I ever got past a basic A2, I'd surprise me and everyone! 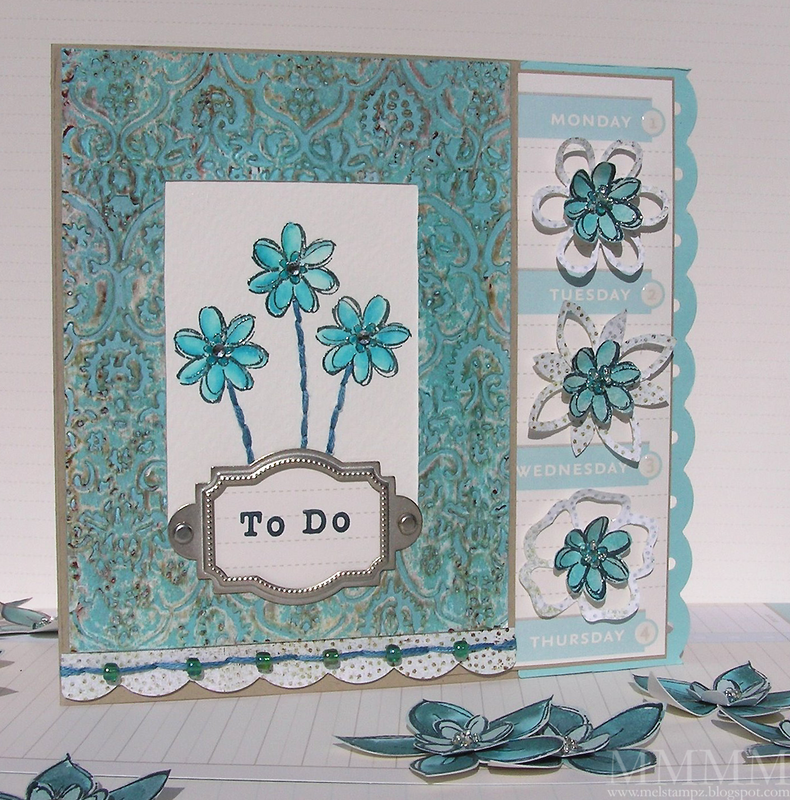 I love all of your crafty tips and tricks Mel! Your faux primas are my favorite. You do it so well! WOW....I LOVE this!! I just wanna sit and gaze at it forever! Love your stuff....I really do!!! YUMMA! This is just gorgeous!! You keep wowing me with your stuff!!! WOW! this is FABULOUS! where are my crayons?! Who knows..maybe melting in the storage shed. Must get more so I can try this awesome technique of yours-you really ROCK. And beads? Dang...I got tons of them because I make jewelry too...note to self...use beads with stamping projects! Girlfriend, you've been busy in the few days I've been away!! First of all, I love the different elements to your card. . .your cards are always so unique! Secondly, thank you for the cheap tricks! I always love learning new ways to create fun things and not break the bank doing it! 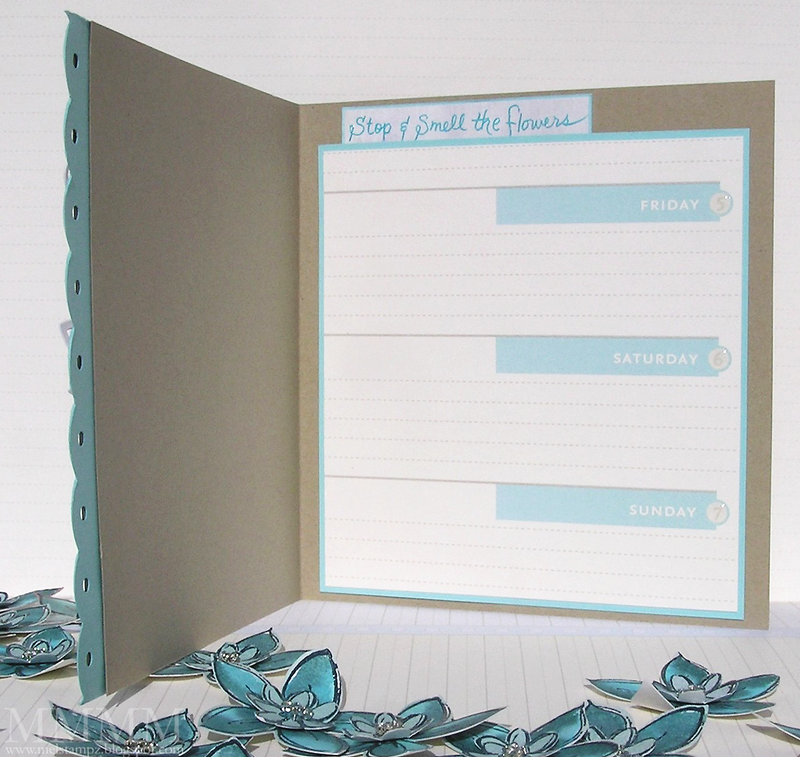 Lastly, keep all your fabulous ideas coming! Seeing all your ideas pushes me to be more creative!! oh wow.... i have nothing to say but WOWSA!